WASHINGTON—House Minority Leader Kevin McCarthy (R-Calif.) canceled all of Rep. Steve King’s committee assignments after The New York Times published a comment by the Iowa Republican that seemed to defend white nationalism. McCarthy’s action provides a stark contrast with that of House Democratic leaders, who awarded newly elected Rep. Ilhan Omar of Minnesota with a seat on the prestigious foreign affairs panel, despite her history of anti-Semitic remarks and activities. King, a lightning-rod conservative Republican since first being elected to the House in 2002, is fighting McCarthy’s action, calling it “an unprecedented assault on my freedom of speech” and claiming the newspaper “mischaracterized” his comments. A spokesman for King couldn’t be reached for comment. Some Democrats sought to have King formally censured but the effort was stymied when House Majority Leader Steny Hoyer (D-Md.) detoured the action to the House Ethics Committee, a panel that is notorious for being a graveyard for ethics actions, regardless of which party controls the chamber. Notably absent from Democratic criticisms of King, however, were comments about the apparent inconsistency with the treatment accorded Omar, who has long supported the boycott, divest, and sanction (BDS) movement against Israel. Omar also has been criticized for a 2012 tweet, in which she said Israel has “hypnotized” the world into not seeing “the evil doings of Israel.” Although the hypnosis allegation isn’t uncommon among anti-Jewish extremists, Omar claimed she was only referring in the tweet to specific actions against Palestinians by Israeli authorities. 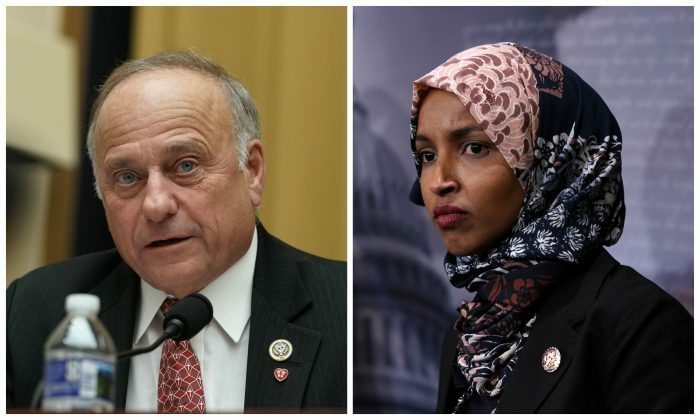 Two Democratic strategists interviewed by The Epoch Times for this story distanced themselves from Omar’s comments, with one of them saying he would strip her committee assignments until she apologizes, and the other seeing it differently. Manley spent two decades on Capitol Hill from 1990 to 2010, working for then-Senate Majority Leader George Mitchell (D-Maine), Sen. Ted Kennedy (D-Mass.) when he was chairman of the Senate Health, Education, Labor, and Pensions Committee, and then-Senate Majority Leader Harry Reid (D-Nev.). Williams also noted that House GOP leader McCarthy contributed $10,000 to King’s 2018 re-election campaign, months before the current controversy erupted on Capitol Hill.